Malacca (Malay: Melaka), dubbed "The Historic State", is the third smallest Malaysian state after Perlis andPenang. 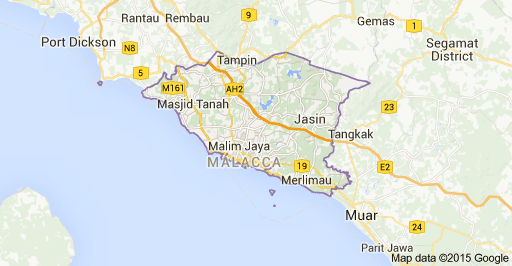 It is located in the southern region of the Malay Peninsula, next to the Straits of Malacca. It bordersNegeri Sembilan to the north and Johor to the south. The capital is Malacca City, which is 148 kilometres (92 miles) south east of Malaysia's capital city Kuala Lumpur, 235 kilometres (146 miles) north west of Johor's largest city Johor Bahru, and 95 km (59 miles) north west of Johor's second largest city, Batu Pahat. This historical city centre has been listed as a UNESCO World Heritage Site since 7 July 2008. Malacca has a population of 821,110 as of 2010.The ethnic composition of the state is Malays 63%, Chinese: 25.3% including the Peranakan community; Indians, including the Chitty people: 6%; Kristang, people with partial Portuguese ancestry: a small community; Dutch Eurasians, Eurasians with Dutch ancestry: a minority within the Malacca Eurasian community.